The Samsung Galaxy S10 launch event is happening sooner than expected, one week ahead of MWC 2019 and it'll be in San Francisco, far from the usual Barcelona venue. Happening Wednesday, February 20, Samsung officially calls this press conference 'Galaxy Unpacked 2019', but we really know what awaits: new flagship smartphones. The launch event time is 11am PT (2pm ET, 7pm GMT) at the Bill Graham Civic Auditorium, a frequent venue for Apple launch events in years past. 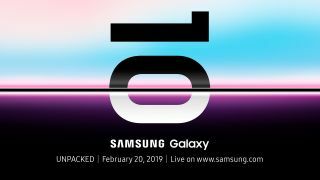 Samsung doesn't officially confirm the Samsung Galaxy S10 name or any details in its invite, but it does cite the fact that 'this year marks the 10-year anniversary of the Galaxy series'. Samsung Galaxy S10 rumors point to big changes to mark a decade of Galaxy handsets, and there may be three different versions, according to several leaks. The biggest rumor is that we'll see a 'hole-punch display' that allows for less bezel at the top, and a small front-facing camera embedded in the screen's top right corner. This is Samsung's solution to avoiding the dreaded notch cut out that the iPhone has popularized, and it's an idea we're seeing from the Honor View 20. Other Galaxy S10 highlights may include an in-screen fingerprint sensor, triple-lens rear camera, and use of the 7nm Qualcomm Snapdragon 855 chipset (or Samsung's own Exynos 9820 chipset outside the US). You may have to decide on which version to get. There are likely to be three versions of the phone this time around: the Samsung Galaxy S10, Samsung Galaxy S10 Plus and the new Samsung Galaxy S10 Lite (or Galaxy S10 E), all with different screen sizes and battery life. With a 6.1-inch screen, the Samsung Galaxy S10 may have a 3,500mAh battery, the 6.4-inch Samsung Galaxy S10 Plus may have a 4,000mAh battery (matching the Note 9 screen size and battery capacity), and a cheaper 5.8-inch Samsung Galaxy S10 Lite may get a standard 3,000mAh battery. That's if the battery size rumors are true. We'll report on the Galaxy S10 launch event live from San Francisco on February 20. Stay tuned for more details and, very likely, further leaks between now and then.